Instrumental Music Ballydonoghue Ashling Madden, Kerriann Dowling, Aoife Lynch, Caoimh Barry, Ryan O Neill. Ballad Group Laura Stack, Aimee Lindsel, Lisa Mulvihill, Lisa Stackpoole. Due to lack of interest from clubs within the district board Scor na Nog in north Kerry due to take place at the Marian Hall Moyvane on Saturday evening next October 18th will not be going ahead this year. North Kerry Scor Na nOg Finals sponsored by Eileen and Paddy Horgan of Amber Filling Station Tarbert Road Listowel will go ahead on Saturday October 18th. 7pm. Venue will be the Marian Hall Moyvane. Participation forms to be with all Club Cultural Officers by this Wednesday October 8th and must be returned to North Kerry Board Cultural Officer, Jack Hennessy, Lahesrough, Ballybunion on or before Wednesday October 15th so there will be a programme of the events on the night. It is compulsory to take part in at least one of the disciplines but you can compete in as many catagories as you wish. Figure Dancing, Solo Singing, Recitation, Instrumental Music, Leiriu, (Novelty), Ballad Group, Set Dancing. All Clubs are expected to take part. It is important to note that the Table Quiz is now a separate competition to be run under the Scor Banner, which will be held on a different night to the final. All Ireland glory for the Kingdom in both Recitation and Set Dancing as the curtain came down on Scor Na nOg, the first competition of the year that started back in November 2013 at District Board level and came to a conclusion on Saturday last in âTravellers Friendâ, Castlebar where the All Ireland Finals took place. Eoin O Donoghue, Kianan O Doherty, Liam Spillane, Gary O Sullivan made it a remarkable occasion for the Club and as each of the victors came forward to be presented with their All Ireland medals by Uachtaran Chumann Luthchleas Gael, Liam O Neill there was great scenes of jubilation amongst the huge Kerry continguent that travelled to the Mayo venue. Not forgetting the Spa Quiz Team of Thomas Fleming, Michael Aherne, James Lynch, Niamh Clifford and despite loosing out still put in a very creditable performance. Without doubt this was a marvellous honour for Coiste Scor Chiarrai to have so many involved at this stage of the competition and all the participants, Tutors and supporters can feel very proud as they did our County proud. Now we move on to the next age group; Scor Sinsear at Fossa Community Centre on Saturday March 15th for the County Finals which will have a 6pm starting time. It was a fantastic evening for the Spa Club as All Ireland glory beckons for their Set Dancers of Ãine Brosnan, Rachel Moynihan, Kianan O'Doherty, Eoin O'Donoghue, Gary O'Sullivan, Liam Spillane, Anna O'Connor & Erin Holland along with Allison Fitzmartin in Recitation; they will now be joined at the All Irelands Finals by the Quiz team of Niamh Clifford, Thomas Fleming, James Lynch and Michael Aherne who at an earlier stage of the competition won through in this category. This winning streak has created history not alone within the Club but also in the County having three representatives from the one Club in both Scor Na nOg and during the mid 2000s also at senior level. However lets not forget our remaining participants of Keel, (Ballad Group), Fossa, (Instrumental Music) and Na Gaeil, (Leiriu); while despite giving tremendous performances and with just one from the four in each category going forward keeping the huge Kerry continguent in tenderhooks it proved just a bridge too far on this occasion. However it was a great honour for Scor in the County to have so many involved at this stage of the competition and all the participants can feel proud of their performances, they did both their respective Clubs and County proud on the day. Former Cultural Officer of the Kerry County Committee, Diarmuid O Shea, Dromid did a wonderful job as Fear a Ti. Cork dominated on the day been victorious in Figure Dancing and Ballad Group, (Boherbue), Solo Singing, (Courcey Rovers), Instrumental Music, (Clyda Rovers), Tipperarys Borrisoleigh won the Leiriu. All Ireland Finals of Scor Na nOg will take place in the Travellers Friend, Castlebar, County Mayo on Saturday March 1st commencing at 3pm. Trath Na gCeist All Ireland Finals at 12am in GMIT. Please note the ScÃ³r na nÃg Munster Finals have been brought forward to 2pm at the Youth Centre in Mallow on this Sunday 26th January. MUNSTER FINALS. This Sunday January 26th 2pm our six Kerry participants will be aiming to reach the All Ireland Finals of Scor Na nOg when they take to the stage at the Mallow Youth Centre. Clubs representing Clare, Waterford, Tipperary, Limerick and the host County Cork will no doubt prove tough opposition. Certainly the standard of competition is top class as you would expect at this stage of the competition. However im sure our Kerry contingent will have worked hard since their tremendous semi final performances at Millstreet two weeks ago and will be up their with the best. From the East Kerry Board we have Spa performing in both Figure and Set Dancing along with Allison Fitzmartin in Recitation. Mid Kerry will have Keel flying the banner in Ballad Group. Another East Kerry club Fossa will be strong contenders in the Instrumental Music section while from Tralee/St. Brendans District Board, Na Gaeil will be our Leiriu representatives. So on behalf of everybody we wish them the best of luck. The All Ireland Finals will take place in the Royal Theatre, Castlebar on Saturday March 1st. MUNSTER FINALS. This Sunday January 26th 2pm our six Kerry participants will be aiming to reach the All Ireland Finals of Scor Na nOg when they take to the stage at the Mallow Youth Centre. Clubs representing Clare, Waterford, Tipperary, Limerick and the host County Cork will no doubt prove tough opposition. Certainly the standard of competition is top class as you would expect at this stage of the competition. However im sure our Kerry contingent will have worked hard since their tremendous semi final performances at Millstreet two weeks ago and will be up their with the best. From the East Kerry Board we have Spa performing in both Figure and Set Dancing along with Allison Fitzmartin in Recitation. Mid Kerry will have Keel flying the banner in Ballad Group. Another East Kerry club Fossa will be strong contenders in the Instrumental Music section while from Tralee/St. Brendans District Board, Na Gaeil will be our Leiriu representatives. So on behalf of everybody we wish them the best of luck. The All Ireland Finals will take place in the Royal Theatre, Castlebar on Saturday March 1st. MEETING. At the executive meeting of Coiste Scor Chiarrai on Thursday January 16th the dates for all the remaining Scor competitions were confirmed. SCOR SINSEAR County Final of Coiste Scor Sinsear Chiarrai will take place on Saturday March 15th with the Quiz at 4pm sharp while all other disciplines will get underway at 6pm. Venue for Senior Final is yet to be confirmed. Kerry will have a bye into the Munster Finals so all the winners at our County Final will go straight into the Munster Finals. Venue here will be Mary.I. Limerick on Saturday April 5th, 6 30pm. All Ireland Finals in the Royal Theatre, Castlebar. QUIZ QUIZ. QUIZ It is very important to note that the Format for the Quiz in both ScÃ³r Na nOg and Scor Sinsear has changed. It is now consists of a one night County Table Quiz. All clubs and Units will come together on the evening of the County Senior Finals on this occasion; (Sat. Mar. 15th) with the outright winner going directly through to the All Ireland Finals in the Royal Theatre,Castlebar where the 32 Counties will battle it out as to who will be crowned Quiz All Ireland champions for 2014..
We are inviting every club and GAA Unit to take part. SCOR NA BPAISTI. (Sponsored by Lee Strand) This competition is for National School children is probably the most popular of all. The following are the competition dates. County Finals. Sunday April 13th in the Tintean Theatre, Ballybunion. All other disciplines will be getting underway at 2 30pm. SCOR CHIARRAI THUAIDH. Dates and venues have been confirmed for both Scor Sinsear and Scor Na bPaisti. The North Kerry Finals of Scor Sinsear (Sponsored by Tom O Sullivan of Kilcolman Agri Supplies, Asdee) will take place in the Community Centre, Asdee on Saturday February 22nd commencing at 7pm sharp. The Tintean Theatre Ballybunion will host the North Kerry Finals of Scor Na bPaisti on Sunday March 23rd commencing at 1 30pm. SPONSOR. Coiste Scor Chiarrai would appreciate anybody who would be willing to come in with any kind of sponsorship for Scor Sinsear. Ciara O'Shea, Ava O'Sullivan, Lamia Switzer, Katie Cronin, Aine Brosnan, Sarah Randals, Rachel Moynihan & Leah Moynihan. SeÃ¡n Kelliher, Cian O'Sullivan, Dean O'Sullivan,Christy Buckley & John Murphy. CÃ¡it NÃ­ ShÃ­thigh, Megan NÃ­ Mhuirthile, ConchÃºr Ã DonnchÃº, Alison NÃ­ Mhuircheartaigh, ClÃ³da NÃ­ GhrÃ­fÃ­n, FionÃ¡n Ã CearÃºill, Cian Ã Coirc. Ãine Brosnan, Rachel Moynihan, Kianan O'Doherty, Eoin O'Donoghue, Gary O'Sullivan, Liam Spillane, Anna O'Connor & Erin Holland. DATES. All the above winners on the day have now qualifyed for the Munster Finals to be staged in Youth Centre, Mallow on Sunday January 26th. The All Ireland Finals will take place at the Royal Theatre, Castlebar, County Mayo on Saturday March 1st. MEETING A meeting of Coiste ScÃ³r ChiarraÃ­ will take place on Thursday next the 16th January at 8pm in The Pavilion Austin Stack Park. All Club and District ScÃ³r Officers are invited. SCOR NA NOG NA MUMHAN. After the short break Scor competitions will be resuming on this Sunday January 12th, 2 30pm at the Millstreet Community Centre where the second Munster Semi Finals of Scor Na nOg 2013/14 will be getting underway with the Counties Kerry, Limerick and the host County Cork in opposition. Looking back at the County Finals where the standard of competition was of a very high standard it is expected that with two qualifying from each catagory all our participants are in with a great chance of going forward to the Munster Finals. The East Kerry Board who dominated at the County Finals will have Spa involved in both Figure and Set Dancing along with Allison Fitzmartin in Recitation. Fossa will take part in the Instrumental Music section, From Castleisland District Board, Ballymacelligott will be the representatives, Orla Keane, in Solo Singing, Tralee/St. Brendans will add their wit in Leiriu while the Mid Kerry Board will have Keel displaying their talents in the Ballad Group section. All the winners on the day will then qualify for the Munster Finals to be staged in Youth Centre, Mallow on Sunday January 26th. The All Ireland Finals will take place at te Royal Theatre, Castlebar, County Mayo on Saturday March 1st. COISTE SCOR CHIARRAI TRATH NA gCEISTEANNA BOIRD. This year the format for this category was changed and is now ran on a separate date to both Scor Na nOg and Scor Sinsear and which will now be the evening prior to the All Ireland Finals where all 32 Counties will be involved. Our County Final was a marvellous occasion and certainly was a close contest all through and only a point separating the top 3 teams at the final round of questions. However the team that will represent the County in the All Ireland Finals of Scor Na nOg in Castlebar on Friday February 28th the eve of the Scor Na nOg Finals will be Spa; (East Kerry Board) Niamh Clifford, Thomas Fleming, James Lynch and Michael Aherne. COISTE SCOR NA NOG COUNTY FINALS. The Coiste Chiarrai Scor Na Nog took place at the Community Centre, Foilmore on Sunday last where the standard of competition was of the highest order. Club Award presented to their Scor Officer, Sheila McCarthy. Instrumental Music went to another East Kerry Club; Fossa while in Solo Singing Orla Keane of Ballymacelligott got the verdict, Keel were winners of the Ballad Group while Na Gaeil completed the day being victorious in the Leiriu. The Chairperson Leona Twiss in her address was delighted with the nights activities and stated that the talent on show was of top quality. She went on to thank everybody present, the competitors and their tutors and anybody who helped in any way to make the night a huge success. All the winners on the night can now audition for T G 4 Scor en Core competitions in the various catagories and hopefully we can have more success as the Renard Set Dancing had last year winning the title. combination came forward they received a great ovation from everybody present.All the winners on the night will now go forward to the Munster semi finals which will go ahead at the Millstreet Community Centre, County Cork on Sunday January 12th at 2 30pm. Ciara O'Shea, Ava O'Sullivan, Lamia Switzer, Katie Cronin, Ã¡ine Brosnan, Sarah Randals, Rachel Moynihan& Leah Moynihan. MUNSTER DATES. All the above winners have now qualified for the Munster semi finals will take place for Counties Kerry, Cork and Limerick on Sunday January 12th at 2 30pm in Millstreet while Cashel will stage the remaining semi final on Sunday January 5th for Counties Clare, Tipperary and Waterford. Munster Finals will take place at a venue to be confirmed on Sunday January 26th. All Ireland Finals Saturday March 1st in Castlebar. November 30th at the I. S. K. Killorglin. This year the format for this category was changed and is now ran on a separate date to both Scor Na nOg and Scor Sinsear. Even though only 8 clubs participated; Austin Stacks, Kilcummin, Listowel Emmets, Fossa, Currow, Beaufort, Laune Rangers and Spa it was a great occasion. for the occasion, the clubs that took part and to anybody who helped in any way during the event..
COISTE SCOR CHIARRAI The Format for the Quiz in ScÃ³r na nÃg has changed. It is now consists of a one night County Table Quiz. All clubs and Units will participate on the one night. The inaugural County Quiz will take place on Saturday 30th November at a venue to be decided. with An TreoraÃ­ OifigiÃºil 2013. Provincial winners at All-Ireland level. 3. Competitors may only compete for one club, their own club. 1. This competition is for club teams of four members. 2. One County quiz (Divisional if county deems that fitting). 3. County Champions advance to All Ireland Finals. 4. Teams shall be seated at a table. 5. The Question Master shall have one set of questions for all teams. 6. 10 Rounds of 10 Questions. 7. Questions to be âinclusiveâ with 7 reasonable questions and 3 of Higher Standard in each round. 8. One round of questions to be âas Gaeilgeâ and to be inclusive. 10. Questions on Current Affairs shall relate to a period of one year prior to the date of the Quiz. 11. GAA questions shall be confined to a period of 20 years prior to the date of the Quiz. 12. The questions used shall be the responsibility of the Organising Committee. 13. Questions shall be of the type which will have a definite answer. 14. No part-questions shall be asked and no half marks shall be awarded. ScÃ³r na nÃg Ã³ cÃºig bliana aniar chuig an lÃ¡ inniu. single questions until a winner is declared. an answer with an incorrect given/first name the answer shall be deemed incorrect. Mary Barry, Aoife O Donnell, Aisling Madden Kerriann Dowling, Aoife Lynch. James Enright, Aine Enright, Finbarr Carrig Muirne Wall, Jack Healy, Katelyn O Mahony Cillian Mangan, Chloe O Carroll. Lisa Mulvihill, Margaret Mulvihill, Laura Stack, Lisa Stackpoole, Amiee Lindsell. Aisling Madden, Aoife O Donnell, Michelle O Connor, Molly Mulvihill, Caoimhe Barry, Kerri Ann Dowling Roisin Kissane, Louise Madden, Shauna Mulvihill. Ballydonoghue, Asdee, Moyvane, Listowel Emmets, Ballylongford, Tarbert. IMPORTANT DATES. All the winners on the night will go forward to the County Semi Finals which will be held in the Knocknagoshel Community Centre on Friday November 22nd, 7pm. The County Finals are scheduled to go ahead on Sunday December 1st, 2 30pm in the Community Centre Foilmore. THE PEOPLE THAT MADE IT ALL HAPPEN; I would like to thank the following Club Cultural Officers who I have been in contact with over the past six weeks for the huge amount of time and effort they have put into the organising of Scor in their Clubs; it certainly made my job a lot easier. IMPORTAN PEOPLE. My thanks also to our Adjudicators. Mary Ryan, Brenda Dowling, Eilish Murphy, M. C. for the night is Mick Flavin. Board Vice Chairman, Eddie Anthony Walsh, Donal O Sullivan on Sound and John Stack, Boards Photographer. A word of thanks also to the Members of the Moyvane G A A and Marian Hall Committee for having everything in order. The North Kerry Finals of Scor Na nOg Sponsored by Eileen and Paddy Horgan, Amber Filling Station, Tarbert Road Listowel will take place in the Marian Hall Moyvane on Saturday November 2nd , 7pm. All Clubs are expected to take part. It is compulsory to take part in any two of the seven competitions but you can compete in as many catagories as you may wish. Figure Dancing, Solo Singing, Recitation, Instrumental Music, Leiriu, (Novelty), Ballad Group, Set Dancing. COUNTY. The first semi final which is for North of the County will take place in the Community Centre, Knocknagoshel on Friday November 22nd, 7pm while for South of the County Glenbeigh Community Centre will be the venue on Saturday November 23rd, 6pm. The County Finals are pencilled in for Sunday December 1st 2 30pm in the Community Centre , Foilmore. It is important to note that the Table Quiz is now a separate competition to be run under the Scor Banner, which will be held on a different night to the final. DISTRICT FINAL DATES. (Scor Na nOg) News in from Siobhain Casey, Renard who informs us that the South Kerry Finals will be held at the Community Centre Foilmore on Sunday November 10th with a starting time of 2 30pm. Tralee District Board Cultural Officer Brian Cable informs us that Tralee/St. Brendans have provisionally fixed their District Finals for Wednesday November 13th. Further details later. Date and venue for the North Kerry Finals of Scor Na nOg has been confirmed and will take place at the Marian hall, Moyvane on Saturday November 2nd commencing at 7pm sharp. Clubs to take part; Moyvane, Knockanure, Finuge, Listowel Emmets, Tarbert, Asdee, Ballylongford, Ballydonoghue, St. Senans, Beale Duagh, Clounmacon. All Clubs must take part in at least 2 catagories but may take part in all 6 if they may wish; Figure Dancing, Solo Singing, Instrumental Music, Recitation, Ballad Group, Set Dancing. Novelty Act and Quiz has been removed from the programme. For further information contact Coiste Scor Chiarrai Thuaidh Cultural Officer; Jack Hennessy at 0879516253 or e mail jacknhennessy@gmail.com. Vice Chairman. Jackie Walsh, St. Senans. Assistant Secretary. Brenda Dowling, Abbeydorney. Chief Steward. Sheila McCarthy, Spa, Killarney. Co Semi Final for North of the County - Friday November 22nd at Knocknagoshel 7pm. Co Semi Final for South of the County - Saturday November 23rd, at Glenbeigh, 6pm. This will apply to all Scor competitions for 2013/14. Thanks; Coiste Scor Chiarrai Thuaidh, Jack Hennessy. The National ScÃ³r Committee has this week issued the new rule book for ScÃ³r competitions. 2. The categories of Recitation, LÃ©iriÃº, Solo singing and Ballad may include pieces based on Irish history and folklore or on the history and folklore of the country of birth/origin of the competitor. 3) Babhta amhÃ¡in as Gaeilge ar imeachtaÃ­Chumann LÃºthchleas Gael. A.G.M. The Coiste Scor Chiarrai Annual A.G.M. will take place at the Austin Stack, Park, Pavilion on this Thursday September 26th with a starting time of 9pm sharp. It is important that 2 delegates from each Club are requested to be in attendance on the night. The curtain came down in Scor Na nOg the first Scor competition of the year that started back in November 2012 at District Board level and came to a conclusion on Saturday last February 23rd in the Dome in County Derry where the All Ireland Finals took place. Kerry were represented in both Recitation, Gearoid Galvin representing his North Kerry club, St. Senans and Spa from the East Kerry Board Liam Spillane, Gary O'Sullivan, Ciaran O'Doherty, Eoin O'Donoghue, Katie O'Connor, Anna O'Connor, Katie Cronin, and Ciara O'Shea taking part in the Set Dancing. The standard of competition was of the highest order with four clubs in each category and just one to be crowned All Ireland Champions; it certainly kept everybody in tenderhooks until the Adjudicators made their final deliberations; however despite giving tremendous performances our Kerry representatives failed to get the Adjudicators nod on the day. In the Recitation Gearoid Galvin was just edged out by Monaghan while the Spa Set Dancers must feel unlucky as they were well in the shake up for honours also. Cavan were the winners here and surely after appearing in the last 7 consecutive All Ireland Finals they deserved their moment of joy in securing their first title in this discipline. There was some consolation for Kerry though as Boherbue of Cork won the Figure Dancing and here Triona Mangan of Killarney. Tipperary in the Novelty Act were the only other Munster County to win. ALL IRELAND On behalf of the North Kerry Football Board we would like to take this opportunity to wish Gearoid Galvin of St. Senans who will be representing his Club, District Board, County and Province in the Recitation catagory at the All Ireland Finals of Scor Na Nog which will take place in the Dome in County Derry on this Saturday 23rd February. While some may think that all of Kerry's efforts revolve around activities on the field of play, I can assure you that on this occasion the very best of Kerry talent will be displayed in two very important categories namely Recitation and Set Dancing at the All Ireland Finals of Scor na nÃg. To reflect on that fantastic journey I will begin by giving a brief profile on the competitors that carry all our hopes and best wishes. In the Recitation category we have a young man by the name of Gearoid Galvin carrying the County colours. Gearoid hails from the St. Senans Club in North Kerry and having been involved in Scor for the past seven years; 2012/13 was the year that he made the break-through winning a County and Munster title in this category. But indeed he is no stranger to the stage having played the leading role in the Clubs Novelty Act and he has to his credit four County Titles, along with making three Munster Final appearances. He also featured in All Irelands and won Titles at Culture Corner and Scleipe Gaeil, (Scealaiocht) Scoil Competitions. The Spa, Set Dancers, carry the East Kerry Football Board and County Colours and who make up the very talented set that saw them emerge in recent times from Scor Na bPaisti a competition first introduced in 2004. Certainly with 12 Senior All Ireland Dancing Titles to their name I suppose All Ireland glory is nothing new to the Spa Club when it comes to Dancing; with their Seniors having achieved glory in both Figure, (6) and Set (5) since 2002. The remaining title was won by Siobhain O Brien in the Solo Singing category back in the late 80s. A remarkable achievement indeed. Having achieved glory at Scor Na bPaisti this latest group who are new to the scene at this level will be strong contenders for a National Title going by their performances to date. However the Club having been involved in Scor Na nOg for over 30 years or so ; this is only their second time to contest an All Ireland at this grade. However the Clubs record speaks for itself when it comes to National Titles in dancing. So spare a taught during the next few days for these young competitors as they embark in a lifetime memory by representing their Club and County at All Ireland level in the wonderful Dome in the beautiful city of Derry. We know they will do us all proud. All Ireland Finals of Scor Na Nog in the Dome, County Derry on February 23rd 2pm. North Kerry Finals, Saturday March 2nd, 7pm at the Community Centre, Asdee. County Senior Scor Finals; Friday March 15th. 7 30pm. Venue Fossa. Munster Semi Finals;(involving Kerry, Clare, Cork, Waterford) Mallow Youth Centre, County Cork. Saturday March 23rd, 6pm. North Kerry Football Finals. At the Tintean Theatre, Ballybunion, Sunday February 24th at 2pm. South of the County; Saturday March 9th at the St. Michaels/Foilmore Community Centre, 2pm. North of the County; Sunday March 10th at the Abbeydorney Community Centre, 3pm.
" style="font-size:small;FONT-SIZE:12pt">We in the North Kerry Football Board were again delighted to announce that a Munster title has gone to St Senan's club for Ritication. In the Recitation category we have a young man by the name of Gearoid Galvin carrying the County colours. Gearoid hails from the St. Senans Club in North Kerry and having been involved in Scor for the past seven years, 2012/13 was the year that he made the break-through winning a County and Munster title in this category. But indeed he is no stranger to the stage having played the leading role in the Clubs Novelty Act he has to his credit four County Titles , along with making three Munster Final appearances. He also featured in All Ireland Titles at Culture Corner and Scleipe Gaeil, (scealaiocht) Scoil Competitions. 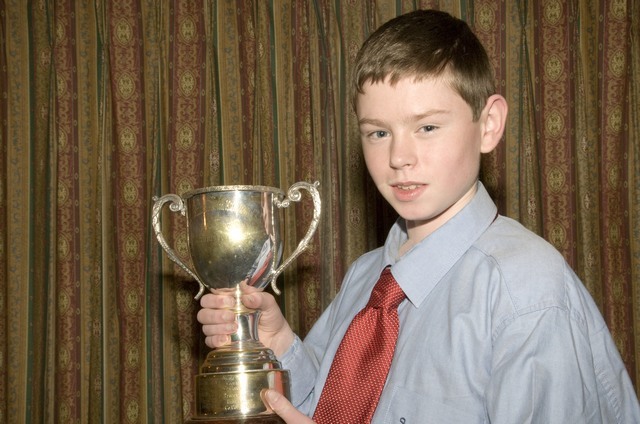 In the past seven years Gearoid has won seven North Kerry Recitation titles. So at the young age of 16 years Gearoid will now appear in the All Ireland Final which takes place on 23rd February in the Dome County Derry. Gearoid will be supported by his family, friends and from his club. But all in the North Kerry District wish Gearoid and St Senan's every success. The North Kerry Football Board will be represented at the 2012/13 Munster Scor Na nOg semi finals by the St. Senans Club in both Instrumental Music(last years Munster Finalists) and Gearoid Galvin in the Recitation category. The Munster Semi Finals will be staged in the Mallow Youth Centre on this Sunday January 27th. On behalf of North Kerry Football we wish them all the best in their quest for further honours. Going by the high standard of competition at both County Semi Finals recently followers of Scor should be in for a great afternoons entertaintment at this Sundays December 9th. County Finals of Coiste Scor Na Nog Chiarrai to be staged at the Tintean Theatre, Ballybunion commencing at 2pm sharp. There will be a wide spread of Districts Boards taking part which should add further to the enjoyment of the event; South Kerry, Mid Kerry, West Kerry, North Kerry Hurling, North Kerry Football, Tralee/St.Brendans, East Kerry and Castleisland District are the District Boards involved. All winners of each category will then go forward to the Munster Semi Finals which will go ahead on Ovens County Cork on Sunday January 6th. Fiona Kavanagh, Na Gaeil Tralee/St. Brendans Board. ST SENANS Aoife Enright, Padraig Enright, Gearoid Galvan, Alannah Kissane, Sean Galvin. MOYVANE Amiee Lindsell, Lisa Mulvihill, Margaret Mulvihill, Laura Stack, Lisa Stackpoole. ST SENANS Aoife Enright, Asling Foran, Yvonne Dillon, Padraig Enright, Donal Hunt, Sean Galvin, Gearoid Galvin, Jonathan McCurtin.